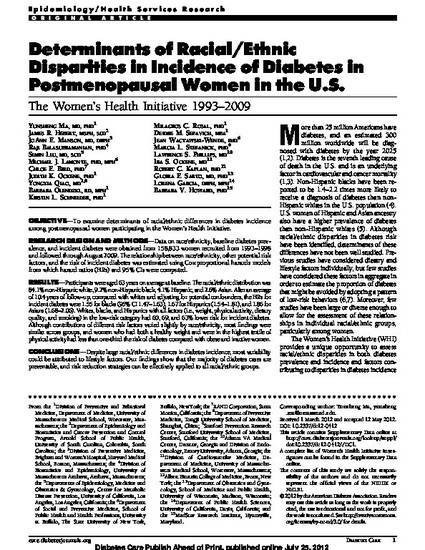 OBJECTIVE: To examine determinants of racial/ethnic differences in diabetes incidence among postmenopausal women participating in the Women's Health Initiative. RESEARCH DESIGN AND METHODS: Data on race/ethnicity, baseline diabetes prevalence, and incident diabetes were obtained from 158,833 women recruited from 1993-1998 and followed through August 2009. The relationship between race/ethnicity, other potential risk factors, and the risk of incident diabetes was estimated using Cox proportional hazards models from which hazard ratios (HRs) and 95% CIs were computed. RESULTS: Participants were aged 63 years on average at baseline. The racial/ethnic distribution was 84.1% non-Hispanic white, 9.2% non-Hispanic black, 4.1% Hispanic, and 2.6% Asian. After an average of 10.4 years of follow-up, compared with whites and adjusting for potential confounders, the HRs for incident diabetes were 1.55 for blacks (95% CI 1.47-1.63), 1.67 for Hispanics (1.54-1.81), and 1.86 for Asians (1.68-2.06). Whites, blacks, and Hispanics with all factors (i.e., weight, physical activity, dietary quality, and smoking) in the low-risk category had 60, 69, and 63% lower risk for incident diabetes. Although contributions of different risk factors varied slightly by race/ethnicity, most findings were similar across groups, and women who had both a healthy weight and were in the highest tertile of physical activity had less than one-third the risk of diabetes compared with obese and inactive women. CONCLUSIONS: Despite large racial/ethnic differences in diabetes incidence, most variability could be attributed to lifestyle factors. Our findings show that the majority of diabetes cases are preventable, and risk reduction strategies can be effectively applied to all racial/ethnic groups. Copyright © 2012 by the American Diabetes Association. Readers may use this article as long as the work is properly cited, the use is educational and not for profit, and the work is not altered. See http://creativecommons.org/licenses/by-nc-nd/3.0/ for details.